Spectrum analysis involves the use of special RF equipment designed to listen to and analyze the frequency bands utilized by Wi-Fi devices. Because these bands are unlicensed, they are often shared with non-Wi-Fi sources of RF signals, such as wireless video cameras, microwave ovens, or cordless phones, which cause interference. The purpose of spectrum analysis is to detect and identify such sources of interference, eliminate them, and/or identify the WLAN channels with minimal interference. CommView for WiFi can perform spectrum analysis by interfacing with Wi-Spy, a USB-based spectrum analyzer. 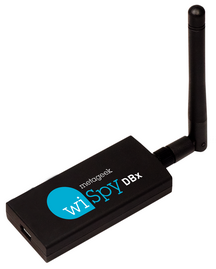 Wi-Spy can be purchased from TamoSoft or directly from MetaGeek. Note that CommView for WiFi DOES NOT support the oldest Wi-Spy model (“Wi-Spy original” with a green logo) or 900x models. When a dual-band model, Wi-Spy DBx, is used, it continuously sweeps both bands, one after the other. Using two Wi-Spy DBx units simultaneously might improve data quality, as CommView for WiFi would dedicate each of the units to one band only. 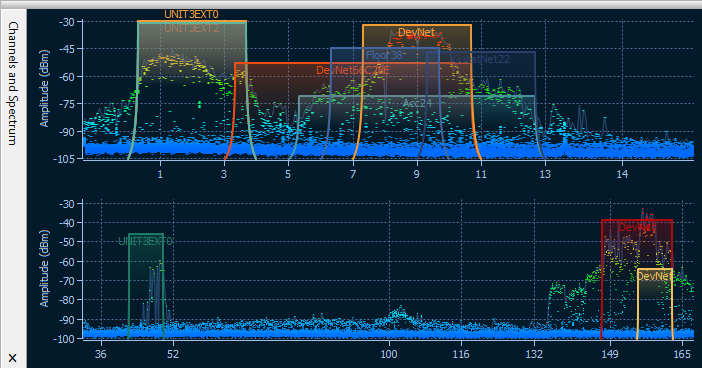 When Wi-Spy is plugged in, a live spectrum picture is displayed on the Channels and Spectrum pane of the main CommView for WiFi window, as shown below. The spectrum pane is similar to the one you can see in Chanalyzer, a spectrum analysis application by MetaGeek that comes with Wi-Spy. By default, the Channels and Spectrum pane displays one or two planar spectrum graphs for single- and dual-band Wi-Spy models, respectively. The appearance of the graphs can be controlled via the context menu. Select 2.4 GHz, 5.0 GHz, or Dual to have the spectrum pane display one of the single frequency bands or two bands simultaneously (5.0 GHz and Dual are available only if you have a dual-band Wi-Spy model.) Select Current Level to display a line that shows the current signal amplitude; select Max Level to display a line that shows the maximum signal amplitude. The X-axis item allows you to select the measurement units of the horizontal axis; you can choose between Frequency in MHz and Channel numbers. By enabling the Waterfall view, you can have the application graph amplitude over time. Select 1/3, 1/2, or 2/3 of the window size to adjust the area of the window occupied by the waterfall graph. The spectrum pane can be detached from the main application window and displayed as a separate floating window. Use the Detach Window and Attach Window to perform the respective operations. You can also hide the Channels and Spectrum pane by checking or unchecking the View => Channels and Spectrum item in the main application menu. Note that in order to view spectrum data in CommView for WiFi, you must close Chanalyzer if it is running; Wi-Spy cannot be accessed and controlled by multiple applications simultaneously.